To understand, design, and implement a new business model. To analyze or renovate an old business model. The Business Model Canvas is a strategic management template for developing new or documenting existing business models. It is a visual chart with elements describing a firm’s value proposition, infrastructure, customers, and finances. 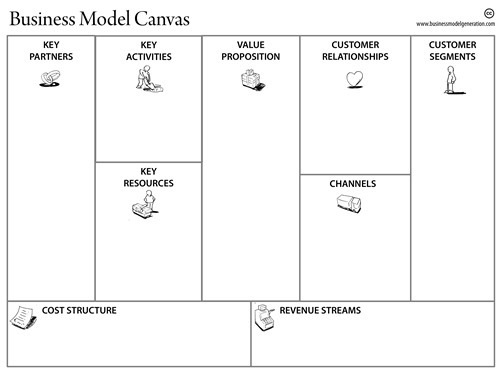 The Business Model Canvas can be printed out on a large surface so groups of people can jointly sketch and discuss business model elements with post-it notes or markers. Ask questions; use techniques such as the Six Universal Questions or the Five Whys. Osterwalder, A., Pigneur, Y. 2010. Business Model Generation: A Handbook for Visionaries, Game Changers, and Challengers, John Wiley & Sons, New Jersey.